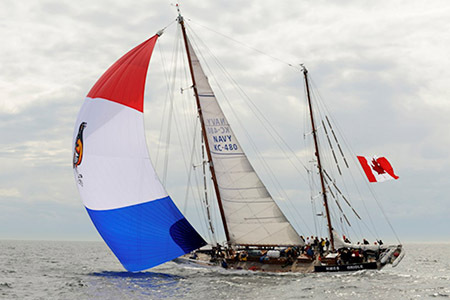 The Miramichi Festival of Tall Ships will be hosting Canada’s own training sailing ship, The HMCS Oriole. The Oriole is currently Canada’s oldest commissioned vessel in the Royal Canadian Navy. Built in 1921, the Oriole was acquired by the Royal Canadian Navy during WWII and returned to private ownership at the end of the war. Reacquired during the cold war for use in the east coast of Canada, the Oriole was then permanently stationed in the west coast of Canada in 1956. HMCS Oriole is a class D vessel and its rig is classed as a BM ketch, which means the vessel is operated by a sailing mast. The Oriole is ported in the southern tip of Vancouver Island, in a town called Esquimalt in British Columbia. HMCS Oriole stands at an impressive 20.66 meters (67 Feet) in height and 27.72 meter (90 feet) in length. Oriole has a standard weight of 69 tons and, fully loaded, weighs a massive 93 tons. This beautiful yacht is powered by the dual mast that is quickly identifiable by its magnificent and almost Acadian red, white and blue sails with a giant Oriole bird marked in the middle of the sail accompanied by its ship markings “Navy KC-480”. The Oriole, also powered by an auxiliary diesel engine capable of 165hp., can reach a maximum speed of 8 knots (15 km/h). Onboard, the ship is solely charted by its five permanent crew members, all of whom are from the Royal Canadian Navy, as well as fifteen youth trainees. A five day Youth leadership training program offered by the Oriole Youth adventure challenge, which has been running for 12 years, offers the participants an opportunity to build self-confidence and trust while living on a Canadian owned sailing vessel. Join us this summer during July 7th to 9th at the Miramichi Festival of Tall Ships and observe The HMCS Oriole. This is indeed a majestic vessel that is deeply filled with Canadian heritage.